One of those days when some shopping and laundry needs to take place. We are hoping to go to Normandy for the weekend. I've been working away on my "Oz in Christmas, " stocking and ornaments. I had a few technical issues making my latest set of videos so I might have to attempt showing the lion being made too. The tinman is done...so adorable. The applique stitch is this video's focus. This the stitch used to attach the majority of the felt pieces in Bucilla stocking kits. With two pilots in the apartment it was bound to happen...we made a trip to the Paris Aerospace Museum...or Musee de l'Air. It is located at the LeBourget Airport, north of Paris. This airport is also famous for hosting the Paris Airshow. The museum was missing these three blue planes in their display so it was not too impressive when we drove up but it turned out to be a good little museum. 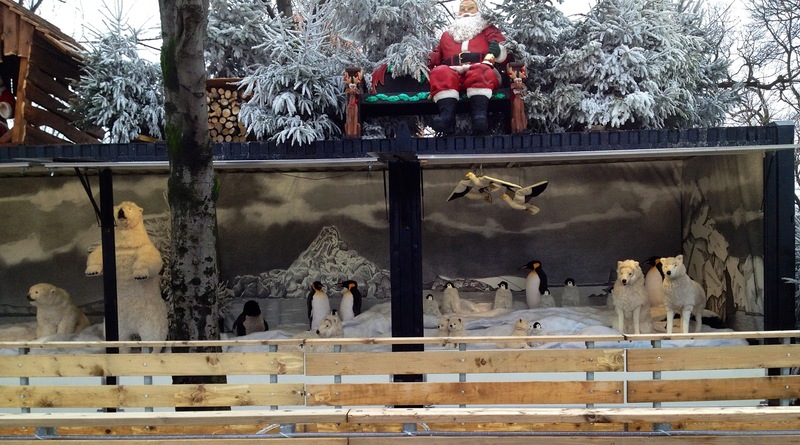 There was a extensive display dedicated to the start of flight. Lots of very early flying machines. Then we made our way to the space side. My husband picked out what he wants for Christmas next year, a vintage P-51 Mustang...WWI era fighter plane. My son tells me Alaska is full of these airplanes that still fly all over the bush today, a DC-3. Outside there were lots of fighter jets. There was a large selection of commercial planes too...sorry I missed getting a photo of those planes. The prototype for the Concorde commercial jet was on display...I guess that is one of the big draws for the museum. A nice outing for the day. How to make the Lazy Daisy Stitch and some tips for putting the "Christmas in Oz," stocking and ornaments together. Today my son and I went to the Louvre Museum. Apparently most of Paris thought it was a good place to be instead of Christmas shopping...but I do have to mention there is a great mall underneath the Louvre...complete with a Starbucks and Apple store...everything this American girl needs. We were going to watch the dvd, "Da Vinci Code," last night but turns out the blue-ray player I bought doesn't play regular dvds...whoops! I read the book years ago but never saw the movie. Maybe I'll see it before my next visit to the Louvre...because I don't think it is possible to ever see everything in that museum. I was all excited to see a visiting exhibit of Raphael's work from Italy. My 18-year-old-son just breezed through that exhibit...I figured paintings didn't really interest him. Thank goodness we came to the statues! He found those very interesting and we even saw a wing of the Louvre that was decorated as Napoleon the III had it when he lived there. Quite spectacular. Most of the areas we visited today were not too terribly crowded but then we decided to see the Mona Lisa before we left...gotta do that! That's where everyone was...horribly crowded in the Italian paintings section. We couldn't wait to get outside afterwards. We trekked to the Latin Quarter and met my husband there for some Greek food. It was delicious and sorely needed to restore my good mood. It's very funny to be around a hungry young man...as we were eating a heavy meal at 4p.m. he was already thinking about dinner! My husband and I told him we could point in the direction for a meal later in the evening...but we would not be joining him. I forgot all to quickly how much my sons could eat! Today my son and I walked our legs off! We started out walking to the Eiffel Tower and then walked along the Seine River. 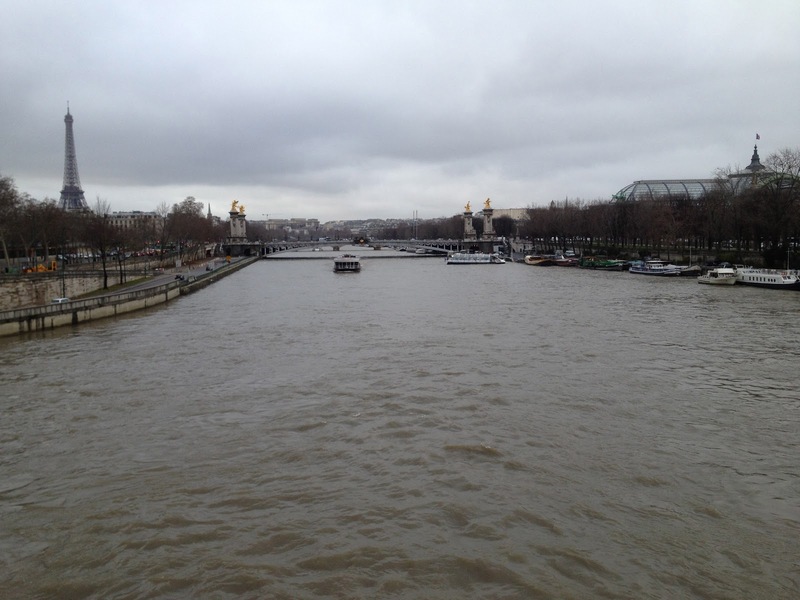 which sits right in the middle of one of Paris's major thoroughfares. 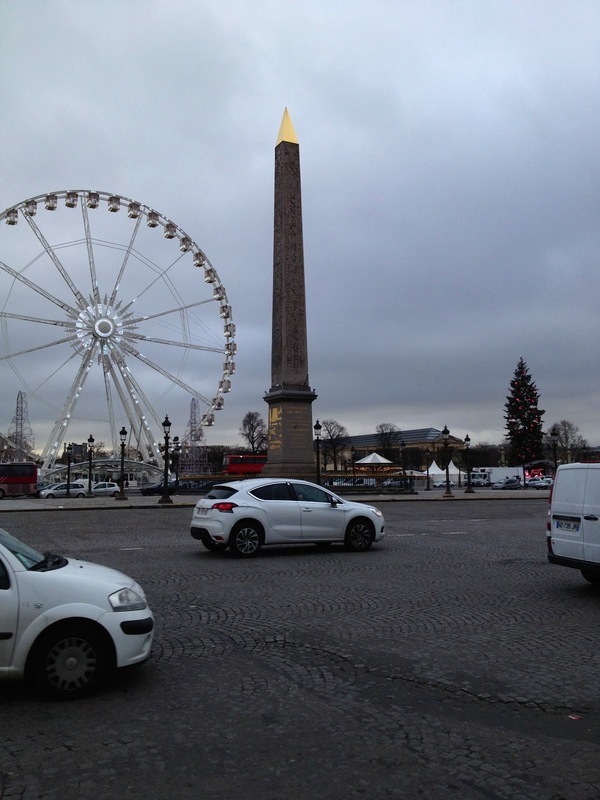 The obelisk marks where the guillotine was set up during the French Revolution that was used to behead Louis the XVI and Marie Antoinette. complete with a ice skating trail around an animal village. Not a great photo but there were polar bears with penguins and arctic wolves. 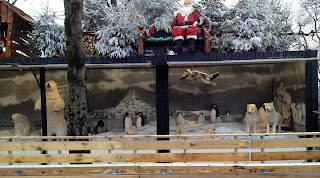 Just a little irritating to me...penguins live on the other pole...not with polar bears and arctic wolves. I love penguins too but this always bugs me! 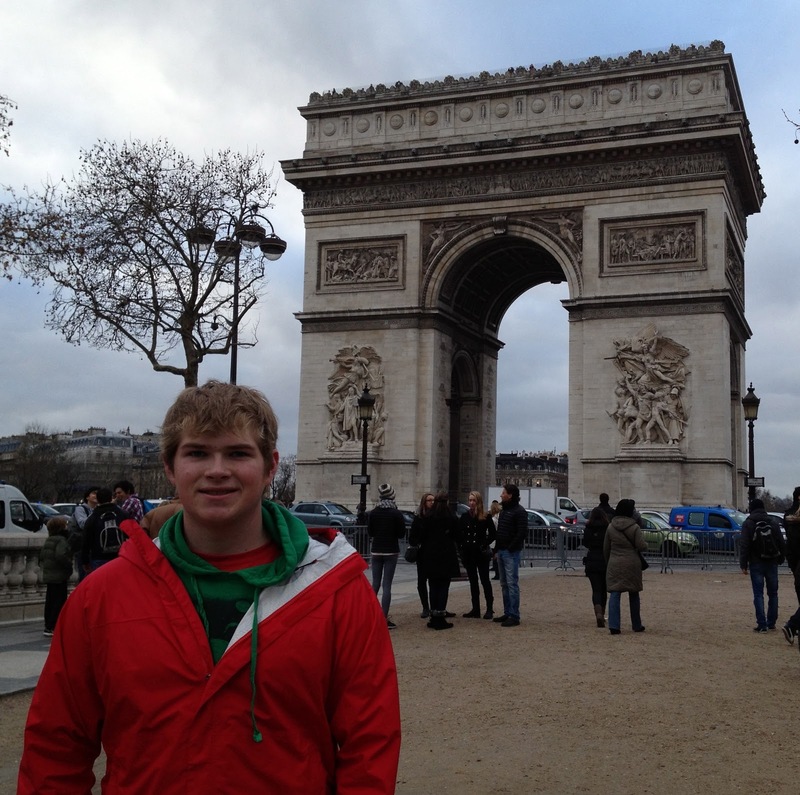 At the end of the Champs Elysees we ended our tour at the Arc de Triomphe. Despite grey skies it was a pleasant temperature and the city was very festive with Christmas decorations. 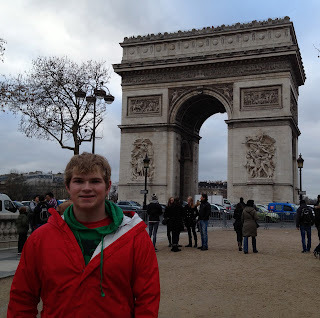 What a delight it is to share Paris with our son, Zack. Due to flight delays he arrived just as rush hour(s) began. My husband was able to drop me off at the Charles De Gaul airport but then he had to go to work. Our plan was for us to get a taxi ride home which usually takes at least an hour...but as we looked at the traffic we knew it could take three hours. So I made the decision to take the train system back to the apartment. It was rush hour on the train system too! There were a few hiccups but after making connections to three different trains...we made it to our apartment within an hour and 15 minutes from leaving the airport. Zack took a quick shower then we went to dinner at a nearby bistro and on the way home I took him by the Eiffel Tower...it really doesn't get much better than that! He has actually expressed an interest in going shopping for some clothes! I know just where to take him...and the Starbucks is on the way. We'll definitely hit some iconic spots in Paris today. I might not work too much on sewing or hand stitching but here's where I am at on my "Christmas in Oz," stocking and ornament set. It's raining...but it just doesn't matter...it's market day. I finally remembered to snap a few pictures halfway through our shopping. One of our regular stops...the coffee man. My husband is having a discussion with him about getting a darker roasted flavor than our last mix. Here's my favorite vegetable and fruit stand...there is a cute Asian-featured gal who speaks English well! She was there to help us today. Anyone know what this is called? 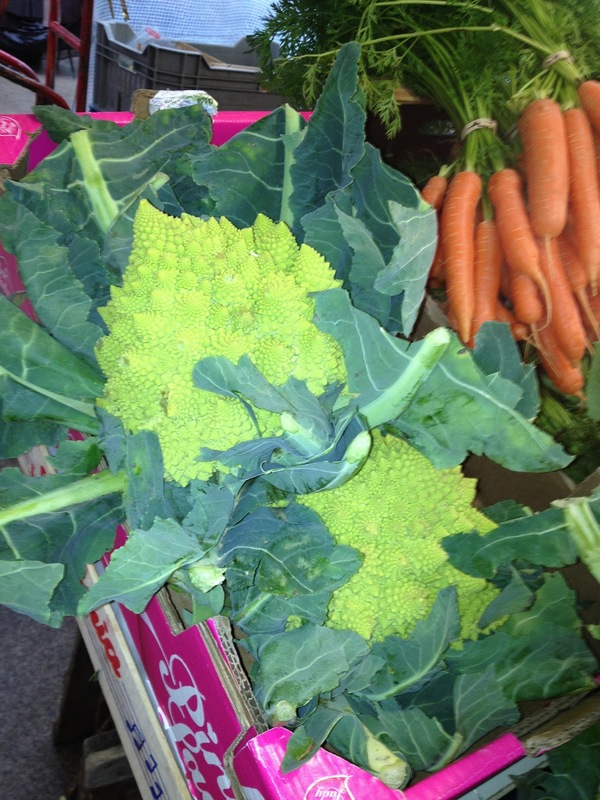 Looks like something between cauliflower and broccoli. 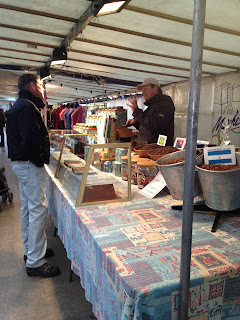 And a quick shot from the cheese booth we frequent...we do love the cheese here but miss sharp cheddar. Of course everything got loaded into my shopping cart. I still need to stop at the bake shop around the corner for our latest favorite sandwich and toast bread. It comes in this cute wooden basket...very thinly sliced. We love it. And I have to share one more photo...I spotted a Gordon Setter yesterday on my walk...we've had two of these wonderful dogs. My husband had one when I met him...it was love at first sight for me...I'm pretty sure his dog had a lot to do with the start of our relationship. Wonderful family pets...much easier to train than Bernese Mountain Dogs...might have to get one of these someday. 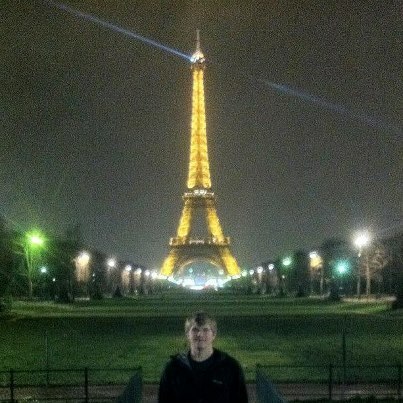 Our youngest son, Zack, gets into Paris today. It will be so nice to have him here for a couple of weeks. Everyday has a little adventure in it. On Sunday I visited a different market that is right by my Starbucks. I really needed some more cheese but I noticed mostly soft cheeses at all the cheese vendors...and of course I forgot my camera. 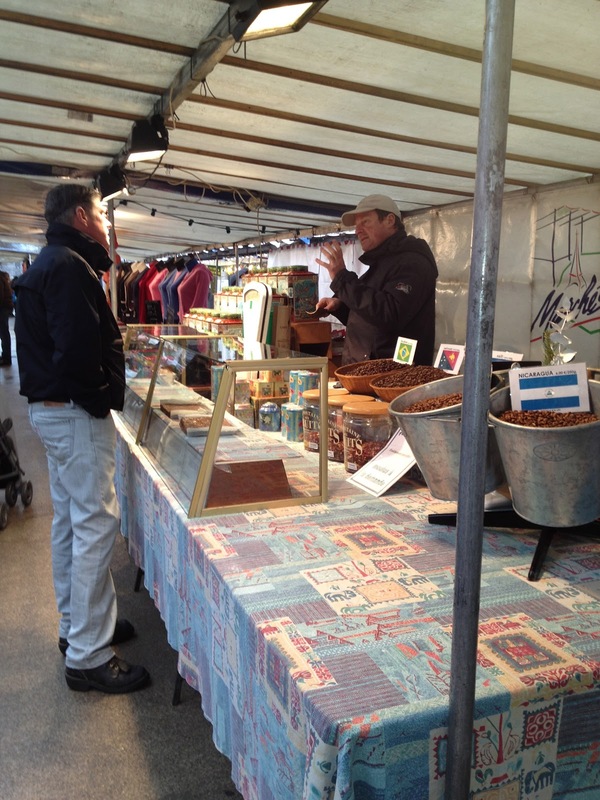 But I did find a new stall to try where prepared meals were being sold. I really find cooking in my small kitchen a little frustrating. There was a yummy looking lasagna so we tried it last night. It looked great and baked up nicely but we were disappointed. Too salty and the meat just tasted different...my husband thinks they use horse sometimes for their ground meat. I don't know what it was...but it wasn't pork and I didn't like it. Darn...I really wanted a simple solution to cooking in my kitchen. But my second purchase looks more safe. I also bought two roasted chickens which are pretty small and some roasted veggies. 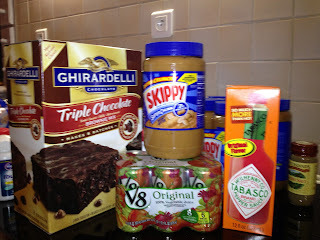 We will have this for dinner tonight. Monday's agenda: 1) get more passport photos for the continuing saga of visa applications, 2) Mail visa documents with photos and signature paperwork to our Paris bank, 3) Purchase adapter for US power cords. Our local metro stop (subway station) has an automated photo booth and that is the accepted route to go for passport photos around here...not my best photos. To mail everything I went to our neighborhood "Mailboxes Etc." and found some great help...meaning someone spoke English...I am so thankful for French people who speak English!!! Our French lessons start after the new year. I wanted to get an adapter for the power cord on my sewing machine so as I was walking I stumbled on a store with yarn in the window...as I looked closer there were embroidery kits and...embroidery floss. But the store is closed on Sundays and Mondays. I cannot wait to go there tomorrow. The store that sells the US adapters was also closed. I hit the local grocery store to buy an adapter but the line was so tremendous I gave up...I have never seen that store so crowded...a Monday at 11:45 a.m....go figure. I've had this kit for years and never started it because I wanted to make two versions at one time...the kitted version and a more modern, batik version. I think the batik version was holding me back so time to just go with the easy version. Totally not my style of kit but it may make a nice gift...it would also look lovely in my traditional Paris apartment. Start Stitching! I show how to add beads and sequins. I also have a hint...how to back out the needle when you make a mistake. I'm pretty sure I'm not the only one who makes a misplaced stitch now and then. I've been making progress on a Bucilla stocking kit, "Christmas in Oz," and am also tackling matching ornaments at the same time. We had two days of rainy weather so today's sunshine was a welcome change. I sauntered up to the Eiffel Tower today for my walk and crossed the Seine River to the Trocadero where a Christmas village of shops was set up. It was very crowded and I didn't find anything to buy but I thought it was fun to see a small ice skating rink set up. Not the best photo of the ice rink...maybe during a weekday I can get some better photos. Good news...the flocked Christmas tree prices have been reduced by 50% today. Lots of white trees left...not too many of the hot pink or red pepper colors left. And I see the black flocked tree is gone already...I committed too early and went with the traditional natural green! Painted twigs and clusters of glass balls are prevalent in the Christmas decor for businesses. That's what caught my eye today. Unfortunately I wasn't patient enough to wait in the huge line at Starbucks today...I was so looking forward to an afternoon caffeine fix. I have added my videos about Bucilla stocking construction to Youtube...it is easier to download to that site than on Blogger. Maybe I'll catch a few more people's interest too! The first sight we had walking into our apartment building when we got back in town was a Christmas tree in the lobby. We think there is a Christmas party for our apartment building residents coming up...not sure...the sign is in French...but we plan to show up. We are having a stormy day here so I am playing in the sewing room. I am going to document on video the making of a Bucilla stocking kit. Every now and then I get a comment from someone with constructions questions. I'm going to try and be very thorough so even an inexperienced stitcher can tackle one of these kits. I figure the more people I can get interested, the more likely these kits are going to continue to be designed. There are four new stocking designs being released sometime this month so I also need to get cranking on my existing stash so I don't feel so guilty when I buy the new kits. Today's quick video will cover pressing the felt pieces. I used teflon pressing sheets. I'm not sure where people can get them because I bought mine years ago at the Houston Quilt Show. Does anyone know if they are available at JoAnns...or maybe local quilt shops? Yesterday we arrived back in Paris. Today our small shipment of household goods came. The tastes of home are a welcome sight. Our trip to the San Francisco was wonderful...except for our visit to the French consulate to get our long-term visas. We've had this ongoing problem with the French government deciding the state abbreviation "AK" is for Arkansas...not Alaska. It has created some problems since the French consulate in Houston is where Arkansas residents must go...they didn't want to take us in San Francisco...after they finally realized it was their mistake the snooty French diplomate became more friendly and processed the visas...but it was touch and go for a while in our world of international relationships. We really need to learn some French! Back to the goodies in our shipment. 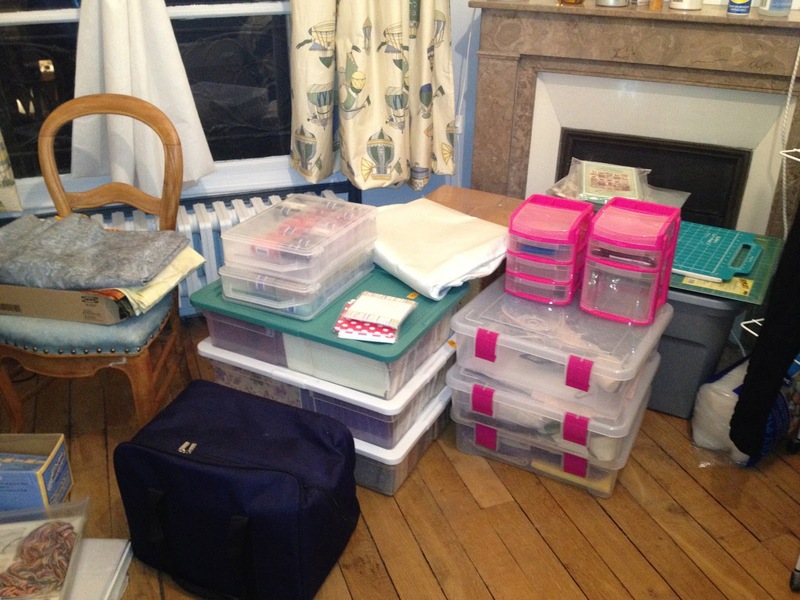 My sewing room is here! So much shopping to do. I have to hit the farmer's market tomorrow so it will be a few more days until I get everything organized. Paris put out it's Christmas decorations while we were gone...I'm going to have to charge up my camera. I just love the way so many of these small restaurants decorated...lots of great ideas. Connecting with U.S. history in Europe has been one of the best parts of living in Paris. On our trip to Mainz, Germany, my husband, who is a retired fighter pilot, brought up the phrase, "Save one for Mainz." I had never heard the phrase. Here's the story behind the saying. After D-Day, the U.S. and Britain started day-and-night bombing raids on the manufacturing centers in Frankfurt, Darmstadt, Stuttgart and Mainz. An American fighter plane was shot down while flying over Mainz and the body of the pilot was dragged through the city and hung up in public where the locals abused him. It was caught on film and exposed in the international press. As a result, whenever American bombers flew missions over the area, they saved one bomb to drop on Mainz at the end of their missions. Most of Mainz was destroyed during the war but the Mainz Cathedral was spared. Construction of the cathedral dates back to 934 though it has burned down several times and been rebuilt repeatedly...sometimes just to change the style to a more updated look. As a result the church now looks like a mix of many time periods. We were very fortunate to be part of a private tour at night of the cathedral. We did it in the dark so there isn't much to show you. Here's a quick look at our tour.